" The WATERFALL Hybrid is our third interconnect based on our very own FUSION Technology. The amorphous alloy of three metals makes a conductor that is free from intercrystalline boundaries, being the main cause of sonic harshness and harmonic structures in other metal cables. we can connect this outer screening on one side (the ground-end) to earth and have it floating on the other side. This way any spurious signals from outside are efficiently blocked without any possibility of interference with the signal path. Together with the already mentioned Fusion Technology, it makes this interconnect very hard to beat in quality as well as in value for money! The Hybrid design and the brown HULLIFLEX® jacket further improve the durability of this interconnect for many years to come. Available with RCA or XLR connectors "
This is a very healthy crossbreed between two of our most valued audio cables: The D - 102 III HYBRID and The INTEGRATION HYBRID. 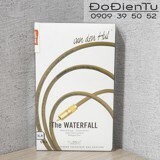 Its versatility allows it to work as a balanced interconnect and as a microphone or music instrument cable. Multi-strand Fusion Technology conductors. This means it has glass-like atomic structure like a non-crystalline frozen liquid and is free from inter crystalline boundaries, which are the number one reason for extra sonic harshness and harmonic structures in metal cables. Highly protective against intensive use. Such consequences as internal material deformation or displacement could lead to a grainy and aggressive sound. Fusion Technology conductors prevent this from happening. Hybrid technology means the conductors are embedded in a conductive layer containing our Linear Structured Carbon ®. Applied in the cable's signal lines and shielding, L. S. C. uplifts the quality and performance with extra mechanical and chemical protection; prevents static electrical charges to arise from cable movements or other dynamic stresses (microphony) and further improves the cable's shielding factor and noise immunity. Armed with a mighty triple layer shielding. It provides perfect cable crosstalk rejection and maximum immunity to radio frequency and other electromagnetic interference in your audio signals. The strong and very flexible jacket is made of rugged and hardwearing HULLIFLEX ®. It provides superb mechanical and chemical protection ensuring a very long lifespan. 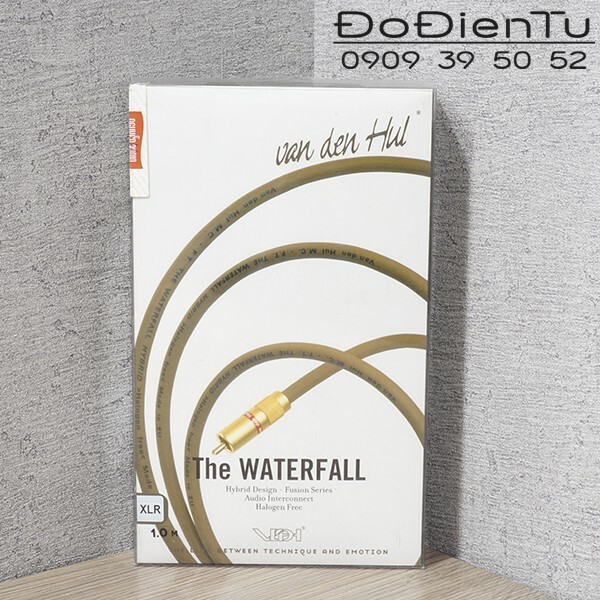 Despite the huge amount of technology packed inside, The WATERFALL HYBRID is only 7.0 mm thick and flexible enough to work as a microphone or music instrument cable. resistance Cores: 0.28 Ohm/m. ; Screen: 1.0 Ohm/100 m.
Our RCA type C - 7.3; Neutrik XLR; Neutrik 1/4" (6.3 mm.) Jack/Phone plug; Custom mountable on ordered lengths. Stereo pair packed with RCA (unbalanced) or XLR (balanced) connectors in 0.8, 1.0, 1.2 and 1.5 m. lengths.